Today, satellites are launched into orbit by multi-staged satellite launch vehicles that can be used only once (expendable). These launch vehicles carry oxidiser along with the fuel for combustion to produce thrust. Launch vehicles designed for one time use are expensive and their efficiency is low because they can carry only 2-4% of their lift-off mass to orbit. Thus, there is a worldwide effort to reduce the launch cost. Nearly 70% of the propellant (fuel-oxidiser combination) carried by today’s launch vehicles consists of oxidiser. Therefore, the next generation launch vehicles must use a propulsion system which can utilise the atmospheric oxygen during their flight through the atmosphere which will considerably reduce the total propellant required to place a satellite in orbit. Also, if those vehicles are made re-usable, the cost of launching satellites will further come down significantly. Thus, the future re-usable launch vehicle concept along with air-breathing propulsion is an exciting candidate offering routine access to space at far lower cost. Considering the strategic nature of air-breathing technology which has the potential to bring a significant shift in the launch vehicle design, worldwide efforts are on to develop the technology for air breathing engines. Ramjet, Scramjet and Dual Mode Ramjet (DMRJ) are the three concepts of air-breathing engines which are being developed by various space agencies. A ramjet is a form of air-breathing jet engine that uses the vehicle’s forward motion to compress incoming air for combustion without a rotating compressor. Fuel is injected in the combustion chamber where it mixes with the hot compressed air and ignites. A ramjet-powered vehicle requires an assisted take-off like a rocket assist to accelerate it to a speed where it begins to produce thrust. Ramjets work most efficiently at supersonic speeds around Mach 3 (three times the speed of sound) and can operate up to speeds of Mach 6. However, the ramjet efficiency starts to drop when the vehicle reaches hypersonic speeds. A scramjet engine is an improvement over the ramjet engine as it efficiently operates at hypersonic speeds and allows supersonic combustion. Thus it is known as Supersonic Combustion Ramjet, or Scramjet. A dual mode ramjet (DMRJ) is a type of jet engine where a ramjet transforms into scramjet over Mach 4-8 range, which means it can efficiently operate both in subsonic and supersonic combustor modes. 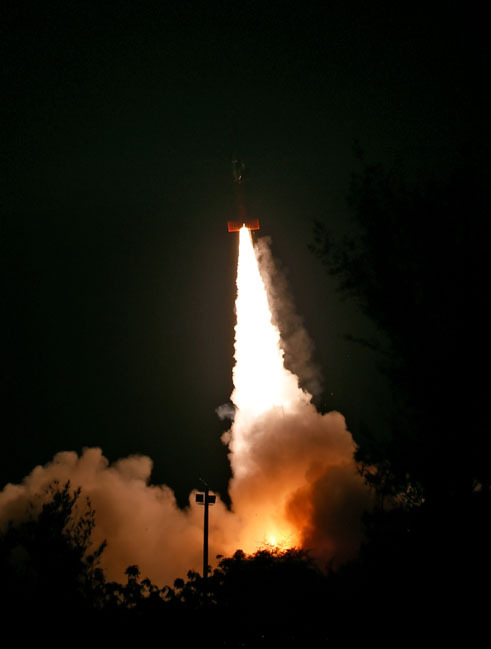 An important development in ISRO’s Air Breathing Propulsion Project (ABPP) occurred on August 28, 2016, which was the successful flight testing of its Scramjet. 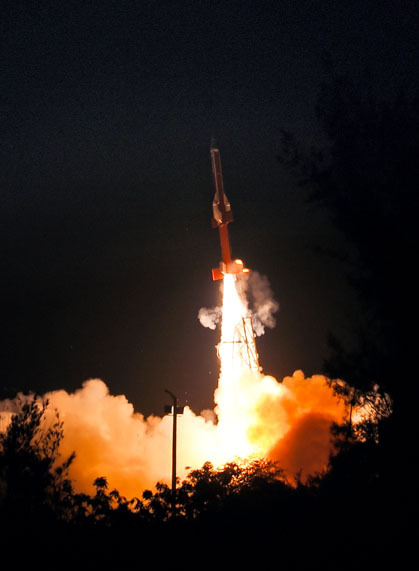 This first experimental mission of ISRO’s Scramjet Engine towards the realisation of an Air Breathing Propulsion System was successfully conducted from Satish Dhawan Space Centre SHAR, Sriharikota. After a smooth countdown of 12 hours, the solid rocket booster carrying the Scramjet Engines lifted off at 0600 hrs (6:00 am) IST. The important flight events, namely, burn out of booster rocket stage, ignition of second stage solid rocket, functioning of Scramjet engines for 5 seconds followed by burn out of the second stage took place exactly as planned. After a flight of about 300 seconds, the vehicle touched down in the Bay of Bengal, approximately 320 km from Sriharikota. The vehicle was successfully tracked during its flight from the ground stations at Sriharikota. With this flight, critical technologies such as ignition of air breathing engines at supersonic speed, holding the flame at supersonic speed, air intake mechanism and fuel injection systems have been successfully demonstrated. The Scramjet engine designed by ISRO uses Hydrogen as fuel and the Oxygen from the atmospheric air as the oxidiser. The August 28 test was the maiden short duration experimental test of ISRO’s Scramjet engine with a hypersonic flight at Mach 6. ISRO’s Advanced Technology Vehicle (ATV), which is an advanced sounding rocket, was the solid rocket booster used for this recent test of Scramjet engines at supersonic conditions. 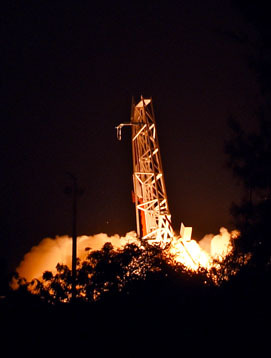 ATV carrying Scramjet engines weighed 3277 kg at lift-off. 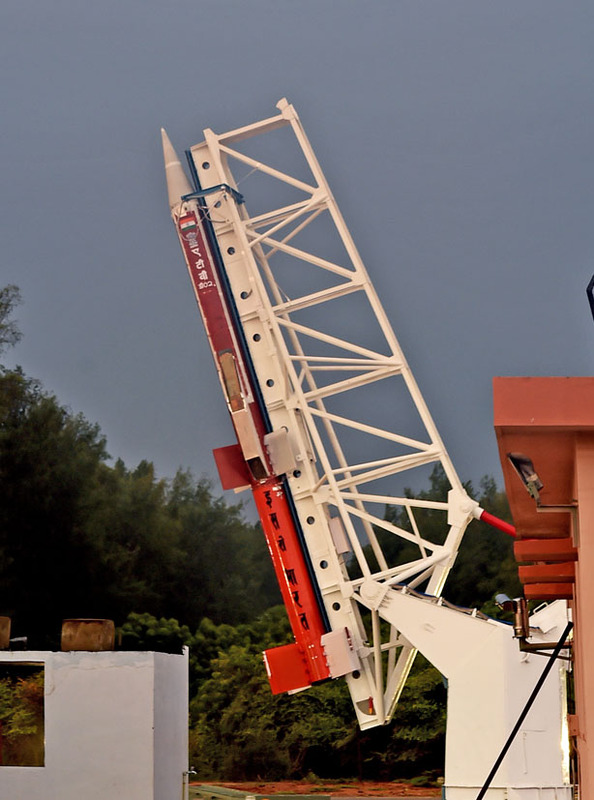 ATV is a two stage spin stabilised launcher with identical solid motors (based on Rohini RH560 sounding rocket) as the first as well as the second stage (booster and sustainer). The twin Scramjet engines were mounted on the back of the second stage. Once the second stage reached the desired conditions for engine “Start-up”, necessary actions were initiated to ignite the Scramjet engines and they functioned for about 5 seconds. ATV flight operations were based on a pre-programmed sequence. Some of the technological challenges handled by ISRO during the development of Scramjet engine include the design and development of Hypersonic engine air intake, the supersonic combustor, development of materials withstanding very high temperatures, computational tools to simulate hypersonic flow, ensuring performance and operability of the engine across a wide range of flight speeds, proper thermal management and ground testing of the engines. 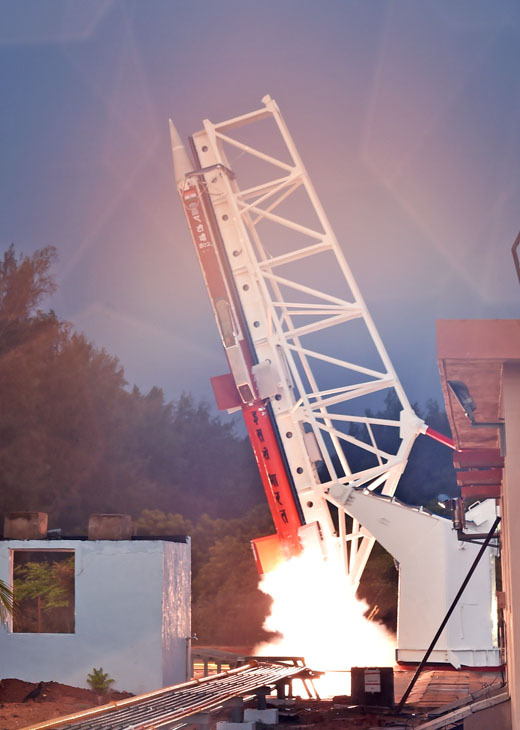 India is the fourth country to demonstrate the flight testing of a Scramjet Engine.